Uzbekistan’s national airline, Uzbekistan Airways, is gearing up for the launch of Boeing 787 Dreamliner operations in late 2016. The airline’s maintenance division, Uzbekistan Airways Technics (UAT), has recently announced that its dedicated unit responsible for the maintenance and repair of the aircraft’s composite components is ready for begin work. A UAT representative told Russian Aviation Insider that Boeing had invested around US $500,000 in the facility for the purpose of furnishing it with an inert atmosphere oven for titanium alloys, a bonding oven, non-destructive testing (NDT) equipment, etc. “The equipment provided is optimized for maintenance of all Boeing aircraft types, but it is also good for repairing composite parts for Airbus aircraft”, the source commented. The composite repair unit’s staff of 22 maintenance and NDT technicians have gone through required training courses at Boeing’s training facilities in Singapore and Seattle. They also have prior experience working with composites, as UAT has previously repaired a number of composite airframe components for Airbus A320 and Boeing 757/767 airlines, including nose cones, aerodynamic fairings, floor panels, etc. 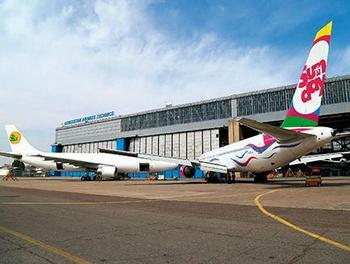 The UAT source could not estimate the new facility’s potential annual workload capacity, but added that “the launch of the new unit, which is unique in terms of its capabilities and is the only composite repair station in all of Central Asia, means that Uzbekistan Airways Technics is moving onto a new level”.